On August 28, 1940, Fitch’s Home for Soldiers and their Orphans, also known as Fitch’s Home for Soldiers, in Darien, closed its doors and relocated hundreds of Connecticut veterans to a new facility in Rocky Hill. 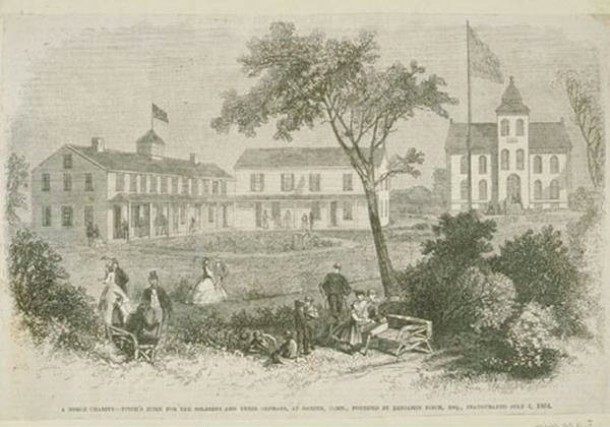 Opened in 1863 and dedicated on July 4, 1864, the Sailors’ Home accommodated hundreds of orphans and thousands of men who served the country in various wars. Benjamin Fitch, a local Darien philanthropist and one of America’s first millionaires, established the home for men who served in the Civil War and for children whose fathers were killed in that war. Fitch donated five acres of land and $100,000 to build the Home, and four two-story buildings, which included a chapel, hospital, library, and a residence hall, became home to thousands of Connecticut soldiers, sailors, and marines from the Indian wars, the Spanish-American War, the Mexican War, and World War I. The grounds were eventually expanded from five to 12 acres and included the Spring Grove Cemetery. Following Fitch’s death in 1883, the Home began to deteriorate. In 1887, town voters petitioned selectmen to ask the General Assembly for legislation ensuring the maintenance of the Home and its residents. In 1888, the State of Connecticut assumed operation of the Home. By the early 1930s the residence was accommodating 1,000 veterans, which caused overcrowding and deteriorating conditions. Administrators began looking for a new, larger location. When the Home closed and the men were moved to the new facility in Rocky Hill, residents included one Civil War veteran, one Indian wars veteran, 50 veterans of the Spanish War, and 499 from World War I. The men took a special train that included four coaches and two baggage cars from the Noroton train station to their new home in Rocky Hill. “Fitch’s Home for Soldiers - The Deceased Veterans Discharge Files, 1882-1936 Database.” Connecticut State Library, 2015. Link. Hawley, Abijah. 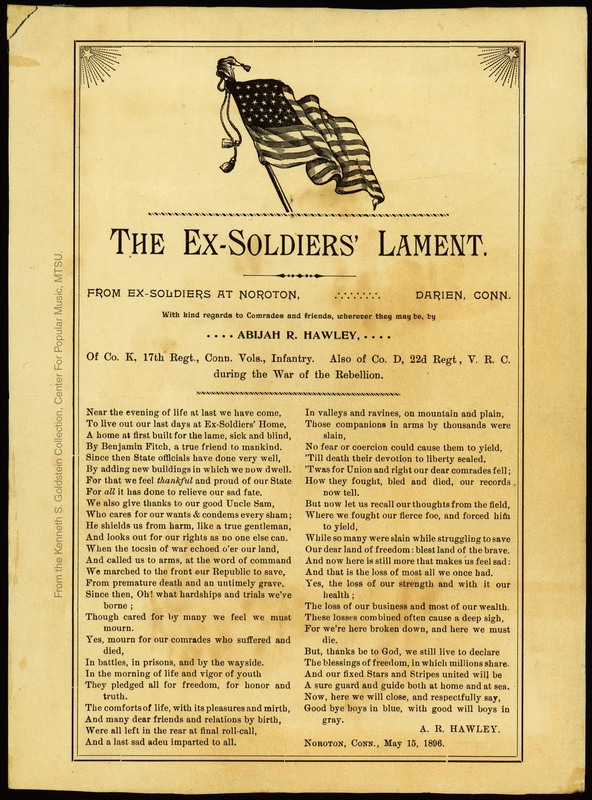 “The Ex-Soldiers’ Lament: From Ex-Soldiers at Noroton, Darien, Conn,” 1896. Link.